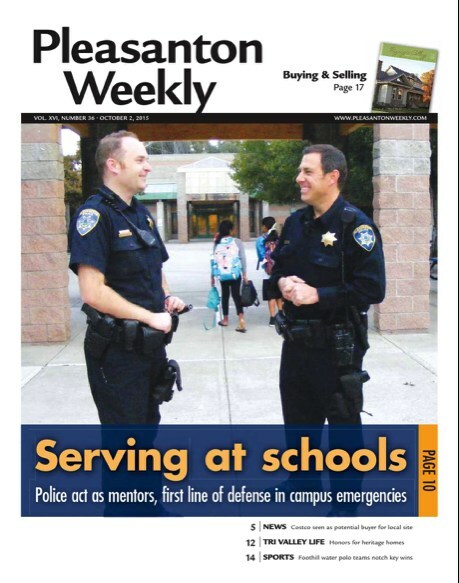 In 2002, the Pleasanton Police Department and the Pleasanton Unified School District implemented the School Resource Officer (SRO) program as a joint effort to keep our schools safe and establish a positive police presence in Pleasanton schools. Two officers are assigned as school resource officers to handle primary responsibilities at the District’s three high schools and three middle schools. Daily activities include meeting and working with students, teachers, parents, counselors, and school administrators. You may see a police vehicle in our school parking lot on occasion signifying that our officers are visiting and checking in to say "hello" and support staff with advice as well. The officers provide advice on a variety of topics, take crime reports, handle disputes at the school, act as counselors, conduct follow-up investigations and guest lecture in classes on a variety of topics. After school hours officers often attend sporting events, dances, back-to-school nights and other school activities and events. D.A.R.E. officers visit the campus in the spring to speak to 7th & 8th Graders. Both officers also work very closely with leadership classes at the schools and assist the students in coordinating successful events. Our School Resource Officers (SROs) are most often associated with their assigned high school, but did you know they spend time at Pleasanton's middle schools as well? Part of an SROs role, at both the middle and high school level, is education - making sure that Pleasanton youth understand the law and the potential consequences of poor choices. During the month of September - SRO Harvey and SRO Rossillon, in partnership with school staff, spent time explaining the rules to PUSD middle and high school students. Some of the topics they covered at the middle schools were bullying, sexual harassment, cyber bullying, healthy communication and an SRO's role on campus. Topics at the high school level included an SROs role on campus, fighting, vaping, harassment and sexting. All presentations covered the many ways a person can reach out for help if needed. By 9/28/18 - the SROs will have presented to every middle school and ninth grade PUSD student... So when you ask your middle schooler or ninth grader "have you learned anything new lately?" we hope they offer up some of what they learned. We love working with our Pleasanton Police Department and School Resource Officers - We are Better Together.